Quick & Easy Drop Biscuits - No milk, No eggs - Oven Ready in 5 Minutes! Well, fall is here and soup season is not far behind! So you need to make sure you have an easy, all purpose biscuit recipe! 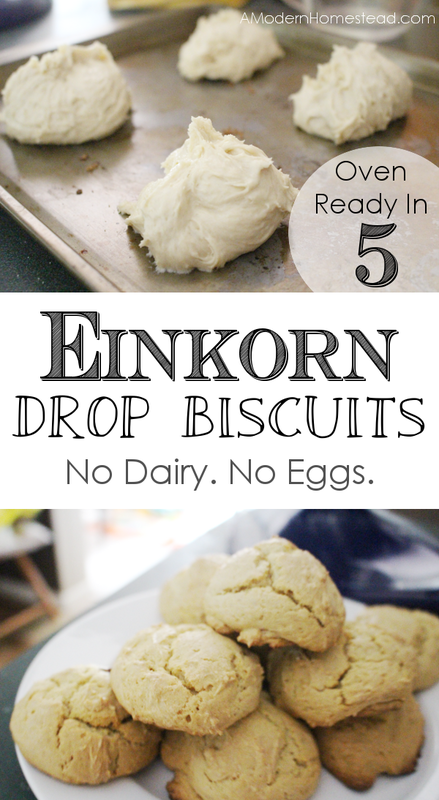 This is my family’s favorite recipe for einkorn flour drop biscuits, and I’ve been making them for years. I wanted to share it with you today! Maybe it’s just me, but for me drop biscuits conjure up this really wonderful image of days gone by. A time when moms were in the kitchen, grandmothers too, with their aprons around their waists… everything covered in flour. The hum of merry chit-chat buzzed around the room and the smell of amazing food laid gently in the air. Snapping myself back to this century, I have to admit that one of the reasons I LOVE drop biscuits is because they are so forgiving. Not to mention, on those days when I’m not feeling all that ambitious, I can still produce an amazing, homemade product for my family to enjoy! Translation: When I’m feeling super lazy, these make a great addition to a simple soup. It doesn’t take much time and it saves us from being tempted to dine out! Plus, honestly, they are just amazing! I even make them on days when I do feel ambitious! 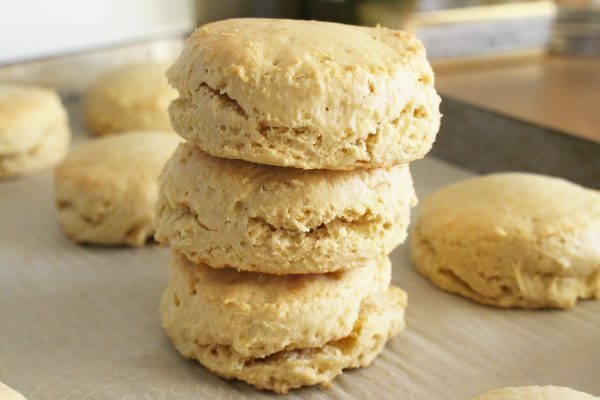 We use einkorn flour for all of our recipes here, but these drop biscuits are just as tender and delicious with any wheat flour. They are oven ready in less than 5 minutes. You only have to clean on dish when you’re done! They taste great with EVERYTHING, from beef stew to strawberry jelly, they are just plain delicious. They require no prior bread-making experience. No yeast to deal with. Biscuits ANY TIME you want! Now, if this sounds like your kind of recipe, then grab your ingredients (I bet you have everything you need already!) and get cooking! 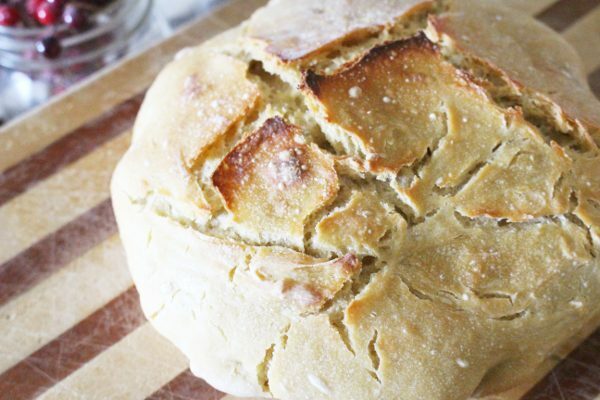 And as always, I like to use Einkorn flour because of the benefits it provides my family. However, you can substitute in regular flour and this recipe still works. Enjoy! Tender drop biscuits that are perfect for soups, gravy and eggs, or a large spoonful of jelly! 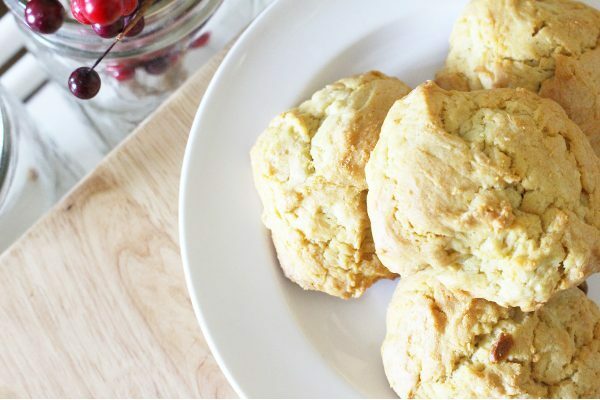 These simple drop biscuits can be made with einkorn or any wheat flour! Add dry ingredients to mixing bowl. Add apple cider and water. Mix on medium until dough is smooth (about 2 minutes). Spoon dough 2 in apart onto baking sheet (dough is supposed to be sticky). *If dough is TOO sticky, let sit for 5 minutes. 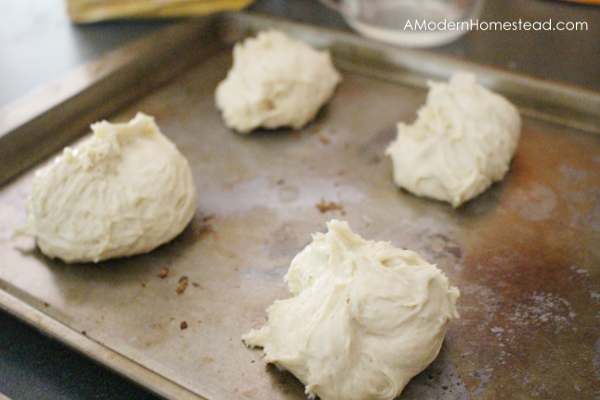 If still too sticky, add 1/4 cup additional flour. 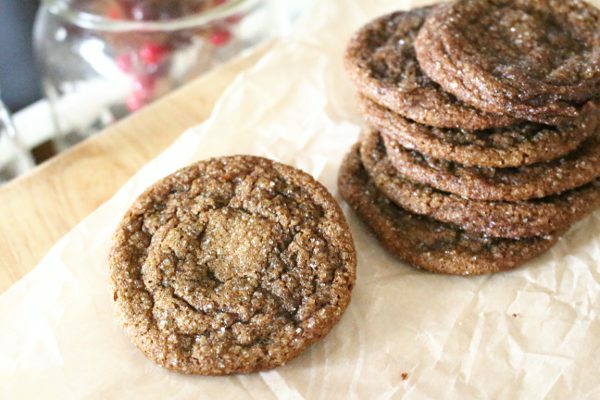 *Coconut oil can be used in place of butter to make this recipe dairy free. Depending on the meal, we may not have many left over. But on the rare occasions when we do have a few (or I make a triple batch), these do really well in a plastic bag on the counter for 5-7 days. Watch for mold and open the bag if you see condensation forming. Most of the time I freeze the biscuits after cooking and then reheat in the oven for a few minutes when ready to eat them! 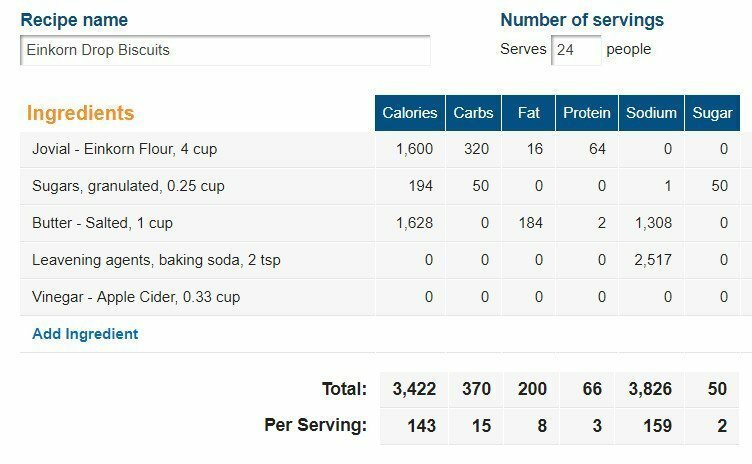 How do I find the nutritional content such as calories etc? 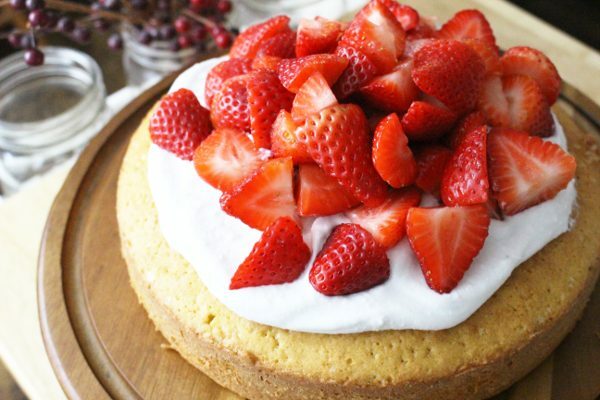 I rarely post comments online, but I just wanted to thank you for sharing this recipe! I just tried it out for our family dinner to go alongside homemade chicken soup and they are delicious. It’s a keeper! Hi Anne-Marie! Thank you so much for your comment! They are a favorite here too. Please stop back by and don’t be shy! These biscuits are so perfect! I normally don’t have a whole lot of luck with the biscuits that you have to roll out and cut, but these were light and fluffy and everything I want in a biscuit. They were perfect with butter and pumpkin spread, and tomorrow night I’ll be eating them with beef pot pie soup. Thanks for this great recipe. It’s a keeper! Oh yay!! I’m so glad you loved them!! They are definitely a favorite here too! Thanks for the awesome feedback! Excited to try these biscuits!. Thank you! !